With the migration to Canvas, maintaining support for anti-plagiarism functionality was important to the LMS Task Force. Thus, WPI has integrated VeriCite software for use within our instance of Canvas. As with the previous anti-plagiarism functionality within Blackboard, VeriCite will scan text-based files (e.g. .docx, .pdf, .txt, etc.) for unoriginal content by checking the file against an internal WPI database of papers and other publicly accessible Internet resources, other VeriCite subscriber databases, and open-access journals. Upon submission, a report is presented to the instructor/TA/grader that highlights the matching text for easy comparison. As of December 2016, VeriCite also integrates with Canvas’ SpeedGrader tool allowing for the instructor to grade and annotate the document right within the browser during an active Canvas session. Create an assignment space as you normally would in Canvas. 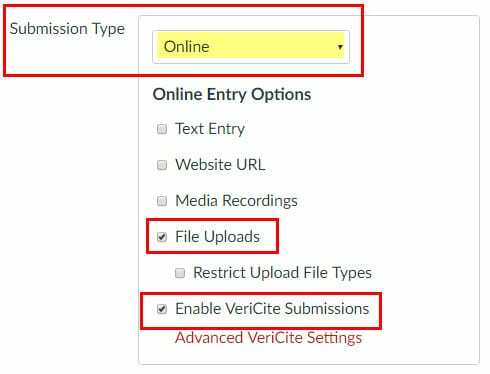 In the Submission Type option, select Online from the drop-down menu and the checkboxes for File Uploads and Enable VeriCite Submissions will appear. For more information, visit this helpful guide on how to add a VeriCite assignment, put together by VeriCite. How do I view a VeriCite report once my students have turned in their assignments? For more information, view VeriCite’s guide on viewing reports for student submissions and navigating VeriCite reports. Will my students know their assignment is being checked for unoriginal content? Absolutely! When a student goes to submit their paper and you have enabled VeriCite for the assignment, they will be asked to check off a box indicating that they are aware of WPI’s Academic Honesty Policy and agree to submit their paper to WPI’s VeriCite database. Depending on what options you selected in the Advanced VeriCite Settings for the assignment, students may also be able to see their report too which will help them understand how much of their assignment may have contained unoriginal content. What if I want my students to submit a draft of their final assignment. Will the final submission come up as plagiarized because of the earlier draft submission? If the assignment is a group project, the safest draft option is to also uncheck the option to Store submission in the Institutional Index in the Advanced VeriCite Settings. This way, if one team member submits the draft and another team member submits the final assignment, the file will not come back as being a significant match to another source. What other resources are there for me to learn more about VeriCite? Vericite has some great documentation! The links below will direct you to their resources. How do I download a student’s original file submission from VeriCite?